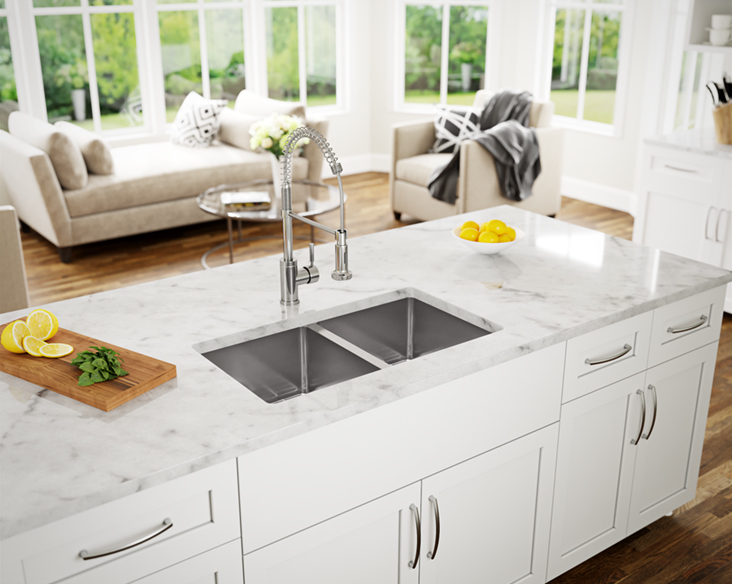 Recently, zero-radius undermount stainless steel sinks have become a kitchen design trendsetter. If you’re not familiar with the term "zero radius", it describes rectangular-shaped sinks whose corners meet at 90-degree angles, rather than broadly curved interiors. The stylish, contemporary design takes cues from ultra-modern philosophy, and their practical shape packs a punch while dishwashing. Overall, this sink is large, bold, and striking. If you’re a fan of Industrial style, or if you simply enjoy keeping up the latest kitchen trends, this sink sounds fantastic, right? Well here’s the catch: Zero-radius sinks require more of your time and attention. Owning one adds to your cleaning to-do list because gunk and grime persist in the tight corners. But here’s the good news: This problem has been solved by the 3/4" radius sink. Gunk and grime are gone. The 3/4" model offers you all the stylish and practical benefits of a zero radius sink, and none of the scrubbing hassle. It’s an all-new industrial sink designed with you in mind. Here’s why. 3/4" radius sinks boast rounded corners throughout, which are about a finger-width in thickness. No more tight corners, and no more cleaning headaches. They still capture minimalist design and the essence of Zen-inspired simplicity - all while rocking "big city" style and saving you time and trouble. Quick tip: You may have heard these kinds of sinks referred to as R10’s, 15mm’s, tight radius, near radius, small radius, or almost zero radius sinks, as well. So, where have these gems been hiding for so long? Borne from professional kitchens, 3/4" radius sinks are now popular options in both commercial and residential kitchens. If you’re a serious home cook, this sink is calling your name. Ultimately, the 3/4" radius sink provides you with a splendid fusion of "Industrial Chic" design and modernism. And easier cleanup too.